Yesterday in T3's Day 1 coverage I have said that CEATEC is the fair in which the biggest Japanese companies present their R&Ds' new experiments. Well, to be exact compared to the past, they seem now more focused on the interaction between different segments of the market (TV and smartphones, home automation and the Internet), with mobile and internet connection pivotal. The difference compared to the past is that while previously every company used to aggressively fight each other to impose its own system - to do the same thing as the rivals (example: Sharp is displaying here at the fair some of its old products that made history) - now each company is undertaking risks and experiments to find new ways to make money. The whole industry willing or not, is moving towards interaction and control coming from external servers, with everything that we own (our house, car, phone and our material body) will be soon (or it is supposed to be) under control by remote. A clear example of what I am saying can be seen in Ideaquest's OWLSIGHT, which is going to check our health conditions without touching nor inspecting us, reporting back with a general health report. The 'Smart' mirror from Panasonic also, sooner or later, will change the way in which we'll use mirrors too, with the system checking our health and also each of our open pores. For those of us who like to keep their skin in tip top shape, this will no doubt be a must-have product. Another example is Fujitsu' s 'Livetalk', an instant translator that's designed to help those who haven't learned a different language when travelling abroad. The ability to travel to a foreign country and be able to speak and get understood by anybody surely is a dream come true to many. Even in this case though, the software is remotely controlled and the speed is 10 times that compared to traditional, Google-based translators. Not to mention the fact that the speed and accuracy is also massively improved. Processed remotely and delivered over the cloud at - providing your Internet connection is good enough - at lightning pace. Last but not least is Lapis Semiconductor's soil sensors, which have the ability to monitor soil environments in real-time to check and improve the productivity of the area. Now let's talk about some of the more flamboyant things we've seen on Day 2. 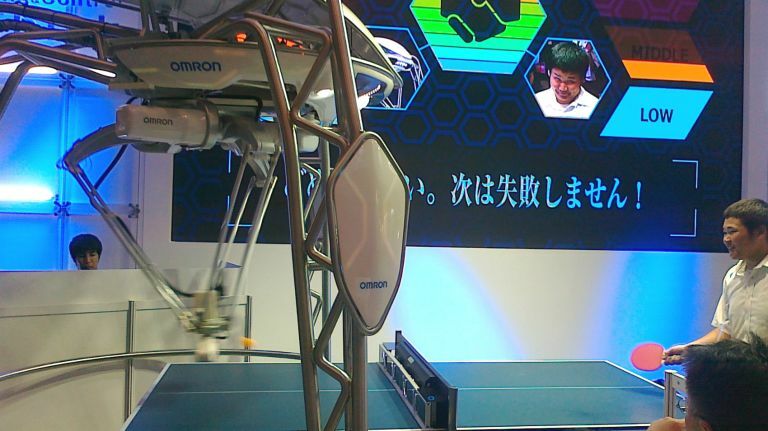 The first thing that comes to mind is the 'ORIZURI', a flying robot paper crane made by ROHM semiconductors. Don't ask me about the reason, or for what it is good for, as I really don't have a clue! Epson, on the other hand, showcased the Moverio BT-300 and BT-2200 AR systems, which I finally have been able to try in first person. Let me tell you that Epson has made a really good product that I really hope in the near future will hit the market, with an impressive OLED display and various functions delivering a proper augmented reality experience. For example, you can help yourself repair your car with instant Internet searches (commanded by your voice and eyes), plus at the same time you can also talk with your best friend, who can also be helping you and checking if you are doing it right. Simply amazing! We have to mention the recycling papers machine named 'PaperLab' too in this section of crazy, a machine that can process 6,720 sheets in an 8-hour work day! Available for the moment only in Japan but, if it is a success, expect to see them hitting western shores shortly. Closing the article I cannot forget the Fujitsu's Retinal imaging laser eye wear that stole the show, at the point that it has been awarded by the Japanese Minister of Economy, Trade and Industry an award for its proven efficency for the blind, or people with low vision thanks to its free-focus mechanism. See you tomorrow for T3's Day 3 report.